He and bandmate Tom Gray have been doing it a while now, laying down double slide guitar improvisations that often seem downright telepathic. It has been two decades since they started playing together — Mark on bottleneck slide and Tom on lap steel — first in Tom’s studio, and then in clubs, coffee shops and barbecue joints around Atlanta. 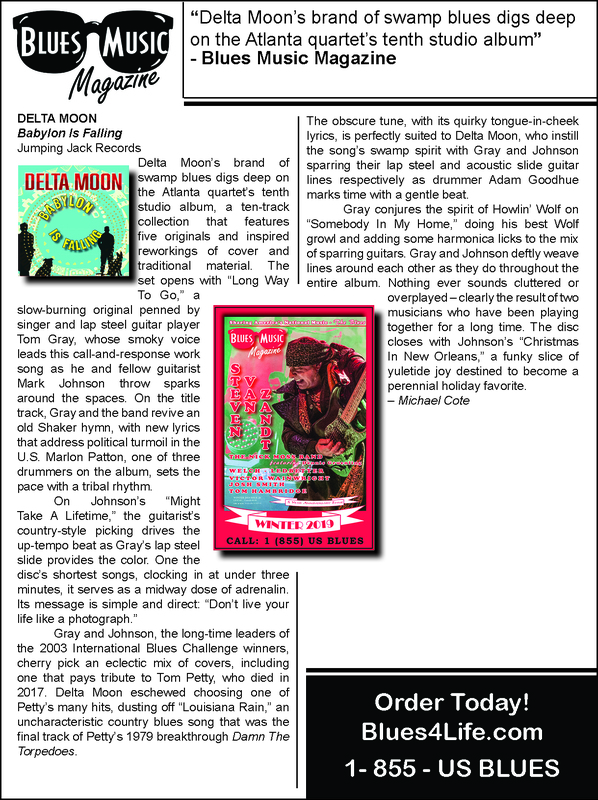 The name Delta Moon came to Mark on a pilgrimage to Muddy Waters’ cabin near Clarksdale, Mississippi, when a brilliant full moon rose over the highway. With the addition of bass and drums Delta Moon quickly gathered a wall-full of local “best” awards. After winning the International Blues Challenge in Memphis in January of 2003, the band went on that year to play the prestigious Montreal Jazz Fest and other festivals, theaters and clubs across America and England. They have worked steadily on the road and in the studio ever since, recording critically acclaimed albums and crisscrossing the United States, Canada and Europe. Bassist Franher Joseph joined Delta Moon as a permanent member in 2007, adding a solid pocket and rich bass vocals.